How do you win national media coverage on an unreported issue? It’s a challenge faced by many nonprofits and watchdog groups. And it’s one Resource Media faced when we knew we wanted to tell the story about the spread of cyanobacteria – aka toxic algae – across US lakes and rivers. The green, slimy stuff is created by the same agricultural runoff and other pollutants that spur the Dead Zone. For years, people living or working near affected lakes have struggled with the ill effects of the often-stinky green slime. Toxic algae drives tourists away, drives up water treatment costs, and threatens fish, wildlife and human health. Local and regional media had covered the problem, but weren’t framing it as a national issue. Meanwhile, no entity was tracking lakes closures or health warnings nationally, and no major economic studies had assessed what freshwater toxic algae costs the US – or even a region. To get a better handle on the scale and scope of the problem, Resource Media began tracking state-issued health warnings, and created our own DIY online map. You can see in one glance that warnings are being issued across the US – and that they are suspiciously absent in many states which don’t monitor the problem. We also partnered with National Wildlife Federation’s Great Lakes Center to publish a report: Toxic Algae: Coming Soon to a Lake Near You? It tells the little-known story behind the green gunk, and makes the call for a national approach to a national problem. 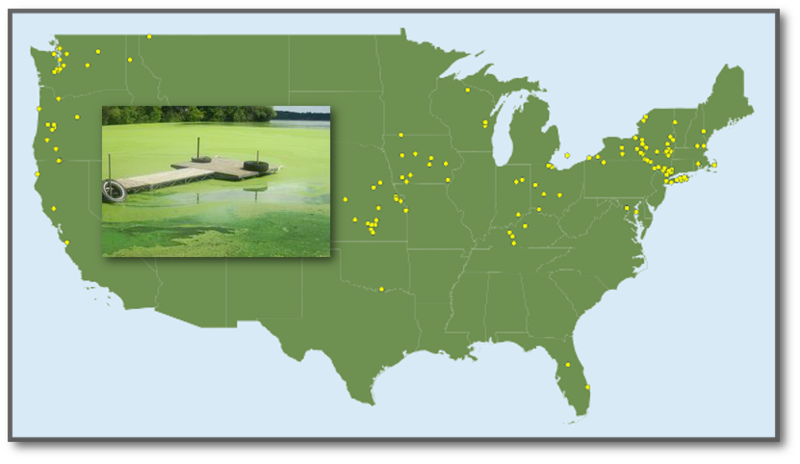 The map and the report did the trick: National media outlets, including the Washington Post, reported on toxic algae as a national problem. They cited the map, the breadth of the scourge, and the need for national attention. Huffington Post Green and Accuweather looked at how climate change will only increase the prevalence of toxic algae. KQED in California also devoted its first feature segment. In addition, the report and map deepened coverage by reporters, such as Spencer Hunt at the Columbus Dispatch, who has reported on the issue for years, and who highlighted Ohio as only one of many states struggling with the slime. The new attention is encouraging, as is the recent respite from algae that autumn’s cooler weather brings. Unfortunately, with no federal government to lead national action, it will be up to advocates to continue to push for solutions to big problems like these. For that reason, keep the map and other visual cues in your communications toolkit to provide one-glance stories. Next Up: What does it take to create your own DIY online map? Stay tuned for an upcoming How-To blog post on DIY online maps!